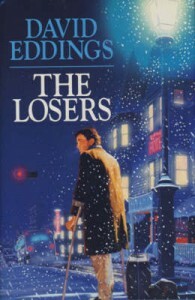 Eddings is best known for his fantasy novels, but he has had occasional forays into mainstream writing – his first novel “High Hunt”, a contemporary adventure, 2002's mystery novel “Regina's Song” and this book, originally written in the 1970s but not published for a couple of decades. The setting is modern day (when it was written) small-town USA, specifically the grim small city of Spokane, Washington. A young sports prodigy named Raphael Taylor is tempted into misbehaviour by his college roommate Damon Flood. After a railroad accident leaves him crippled, Raphael retreats into himself, renting a small flat in Spokane and refusing to have anything to do with his former friends. He passes the time by observing the lively and unconventional characters that live in the street below his flat that he nicknames 'The Losers', eventually starting to come to terms with his injury and managing to edge towards being able to restart his life. However, his life is thrown into turmoil by the reappearance of Flood, who starts to meddle with the local residents after Raphael tells him about his fascination with their lives. Soon, Raphael begins to realise that Damon is a malevolent influence on his life, but can't see any way to deal with him. It is a big departure from Eddings' usual work, this is slow-moving emotional novel with little action but a fair amount of depth. It is well written, with a quality of writing that puts to shame most of his other efforts. The dialogue and characterisation is more serious and less witty than in his fantasy novels, but is still very effective making the characters that populate this tale strangely likeable despite their unsuccessful lives. Throw in some symbolism and some acerbic social commentary and the result is probably Eddings' best work. In summary, this is possibly the best piece of writing that Eddings has done. However, the radically different setting from his other novels may put some of his ordinary fans off a bit.